DNS Accountants is a specialist accounting firm for contractors in Milton Keynes and all over UK. With our unique approach and commitment, we have become a trusted name in the accounting industry. As a reputed national accountings company, we integrate expertise with dedication and deliver the best accounting solutions to our clients. This is what has helped us gain a loyal customer base across the UK. We aim to simplify accounting for contractors in Milton Keynes, bring efficiency to all their tasks, enable them to take good financial decisions and ultimately pave way for their success. At DNS Accountants, we provide you not just the basic accounting services but extend all support to help your business grow. This consistent commitment is what sets us apart from the rest of the accounting firms. Many recognitions have come our way for our outstanding performance in the accounting industry. We are the winners of The British Accountancy Awards 2013 and the finalists of The British Accountancy Awards 2014. Having served as accountants for contractors in Milton Keynes and other cities of UK, we have helped thousands of clients overcome their challenges. This valuable experience is what helps us handle your needs with competence. We are an IPSE certified accounting firm and have a team of well qualified accountants to help you. They are all either members of professional accounting councils or hold university degrees from prestigious educational institutions. As a contractor, you want to able to make the maximum profit. If you are worried about penalties, it is time to relax. We give all our clients the assurance of no penalties. If you end up with a penalty due to our fault, we will pay you £250 and also cover the penalty amount. We provide all our clients with a dedicated portfolio manager so that they can get a hassle free experience working with us. You can get in touch with us whenever you want as we are willing to assist you even on weekends. Selecting an accountant is never an easy task. A good accountant can play a major role in the growth of your business but a bad one can hamper your chances of success. That is why you need the best accounting firm to help you. At DNS Accountants, there is no compromise when it comes to the quality of services we provide. The testimonials of our satisfied customers will show you why we are among the best contractor accountants of UK. WHY CHOOSE US IF YOU ARE A CONTRACTOR? Contracting is an excellent choice of career because of the advantages and flexibility it provides. In case you are new to contracting, be sure to choose DNS Accountants, the best accountant in the field with exclusive packages for contractors. If you are worried about the IR35 legislation, we can solve your all your concerns. We will help you determine if you will be affected by it and guide you so that you are free from risks and comply with the IR35 legislation. With our guidance you will be able to understand VAT better. Even though VAT may seem complicated for a beginner, being unaware of it may result in you missing out its advantages. We help you take the best decision regarding VAT and complete the VAT registration in case you need it. We can also assist you with expense claims so that you can maximize your earnings. For a contractor, working using an umbrella company is not the most profitable option available. Compared to working through a limited company, using an umbrella company will give you less chances of making expense claims. You also need to pay more National insurance. This means you will be earning less than what you are capable of. We recommend our client contractors to continue working through an umbrella company only if they have no intentions of continuing as contractors on a long term basis but have chosen the path only for a brief period of three months or less. With our timely guidance we ensure that you do not fall into the IR35 trap. If you feel that your accountant cannot handle all your requirements or is not fully competent, it is time for you to choose a different one. Just get in touch with us and we will make the transition smooth for you. We have extensive experience helping contractors maximize their earnings. Being the best tax accountants, Milton Keynes we focus on tax planning strategies which help our clients save more. Our online accounting system will bring efficiency to your accounting and give you a real-time view of your accounts whenever you want. 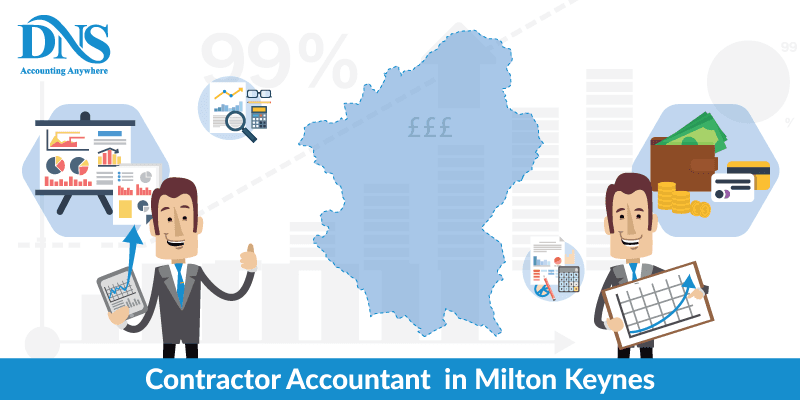 As the top contractor accountants Milton Keynes, we have proven ourselves over the years with our proactive services and insightful guidance to contractors. You can also avail our services at Luton and Northampton. DNS Accountants brings you the highest quality services at affordable pricing. Choose us your accounting partner to feel the difference.